After you finish a conversation, tap Phone→Recents. A list of recent incoming and outgoing calls appears. Tap the Info button to the right of the number you want to add, it can be from a call you received or one you initiated. A New Contact screen opens. Type in the information you have and select a special ringtone if you want. Tap Add to Existing Contact. Search for the contact you want to add the number to and add the number in the appropriate field. 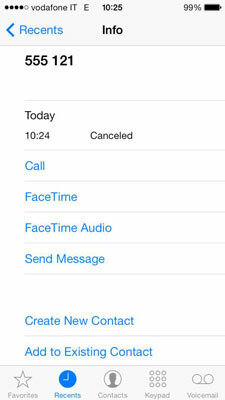 With iOS 7, you can block incoming calls from specific numbers by tapping the Info button next to the undesired caller, scrolling down to the bottom of the screen that opens, and tapping Block this Caller. Enter the number you want to call, but don’t tap Call. Tap + Add to Contacts at the top of the screen just under the number. Tap the button for the action you want to take. Follow the procedure for creating a new contact or adding a number to an existing contact. Tap Messages on the Home screen. Tap the message that came from an unidentified number. Tap Contact, and then tap the Info button. Follow Steps 3 through 6 as outlined previously. Tap Mail on the Home screen. In the address fields, tap the sender’s or recipient’s address and then choose Create New Contact or Add to Existing Contact on the screen that appears. On an address within a message, tap and hold the address and then choose Add to Contacts, and then choose Create New Contact or Add to Existing Contact on the screen that appears. If you have numbers that you call frequently, you can add them to the Favorites list on the Phone app. 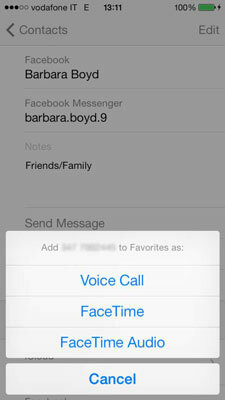 Open the contact you call frequently and tap the Add to Favorites button at the bottom of the Info screen. If there’s just one phone number, choose the type of call you want to add to Favorites: Voice Call, FaceTime, or FaceTime Audio. If there are multiple numbers, a dialog shows all the numbers and you tap on the number you want to add to the Favorites list in Phone, and then choose the type of call.